Pursuant to a declaration dated 25 March 2010, the signatories thereto provided a broader mandate for worldwide education centered on Consciousness Based Education-CBE, and to work together to promote, strengthen, disseminate and advance knowledge through research on indigenous rural, art & culture, science, management, technology and peace studies. 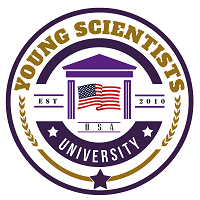 Based on this mandate, Young Scientists University- YSU was established and incorporated in USA for its global outreach. Corporate number 100615573. Col Dr. Gunter Chasse who represented the Council of the Global Country of World Peace became its first Chancellor, while Dr. Susie Dilbeck, Member of the Board of Trustees of Maharishi University of Management, USA and The President of IFCBE, USA, was appointed to the Senate. Dr. Taddy Blecher was nominated to the International Council. Dame Dr. Aspasia Peppa from Greece was appointed as International Director for Europe & Subsequently Sir Dr. Roland Yakoubov was appointed as Director, USA, also YSU announced affiliation with Roland Bioenergy Healing Institute, USA. Announcement for Affiliation with Hebron Eco University, Sri Lanka for Campus and Theology Related Residential Program at Nortan Bridge, Campus. Affiliation with Indian Management Academy- IMA, INDIA for development of university in Asian region in the field of management & technology. Recently during the last board meeting and based on the approval from the governing council and board of trustees it was unanimously decided to appoint Prof. Dr. Sir. Lakshman Madurasinghe as the officiating International President & Prof. Dr. Sir GD Singh as Vice President International Affairs with additional charge of development of Peace Studies through World Peace & Diplomacy Organisation-WPDO and Quality assurance Monitoring in association with CIAC Global.